VoiceFoundry are driven to deliver the ultimate customer experience. We specialise in creating cloud-based enterprise contact centre solutions and are uniquely focused on helping businesses improve customer engagement, while maximising the benefits of the cloud. As a collective, our expertise lies in AI & natural language automation, CTI, enterprise integration, UX design, analytics and workforce optimisation. With the continuous pursuit of customer success, our team is driven to disprove the notion that software projects have to be painful – and that technology must be more difficult to work. We partner with the best connectors in the market to deliver dynamic interactions for customers. We are experienced in deploying Amazon Connect, a cloud-based enterprise contact centre solution, as well as other Amazon products that focus on creating customer interactions. 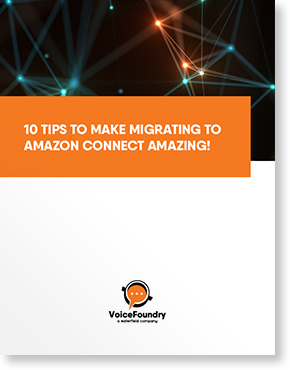 Our team is understands industry best practices and know how to implement a system that creates a great transition when moving to Amazon Connect. We focus on understanding your business model and help bring your ideal customer experience to life. We strive to deliver the right solutions and applications to meet your requirements. With the right mix of expert knowledge and innovative products with Amazon Web Services we make your vision a reality. VoiceFoundry Australia is a global extension to the VoiceFoundry international head office in the USA. Together, we form part of the Waterfield Technologies portfolio of companies. Waterfield Technologies is a leading enterprise software and professional services company providing Voice and Mobility solutions for organisations. Waterfield was founded in 1928, and has since provided global solutions in the financial services market for close to 100 years. With extensive experience and technical competencies, Waterfield develops innovative applications that drive customer engagement and generate rapid deployment tactics to adapt applications for quickly changing business requirements.